In thinking about gossip, we giggle and think of something trivial we said behind someone’s back. Never thought much regarding the power of gossip until a professor in my A Brief History of Mankind MOOC identified gossip as one of the most important characteristics in the evolution of man. His argument is: gossip allows us to interact in ever-increasing social circles and, without it, we would be confounded in making new connections with persons in groups outside of our own. Similar to a point made in Wikipedia: Gossip is crucial in the forming of social bonds in large groups. People quickly get up to speed on characteristics and rumors of someone new in another group. With social media, gossip is potent. It can sway the opinions of large networks of users in a frighteningly swift manner. A single post on Facebook or Twitter can command the attention of many people, especially as it gets introduced to ‘other groups’ as users share or like it. Gossip in social media blurs any distinction between personal and professional conduct; it is impossible to keep a personal life out of the prying eyes of coworkers, clients, and associates. The primary benefit of gossip is “it is intimately connected with the moral rules of a given society, and individuals gain or lose prestige in their groups depending on how well they follow these rules”. [i] This is why gossip has endured through ages. I think it is worth accepting the existence of gossip and that it may serve a purpose, so separate useful information and gossip; as a corporate-training executive put it, “one person’s gossip is another’s ‘information-sharing’”[iv]. Think about the intent behind it. Does it affect you in any way? Instead of tearing someone else down, why not improve your own perceptions and talk to someone directly. Once you partake in gossip, it never goes away (especially in a digital form – a text message, social media post, or an email). It can also erode trust and damage relationships. 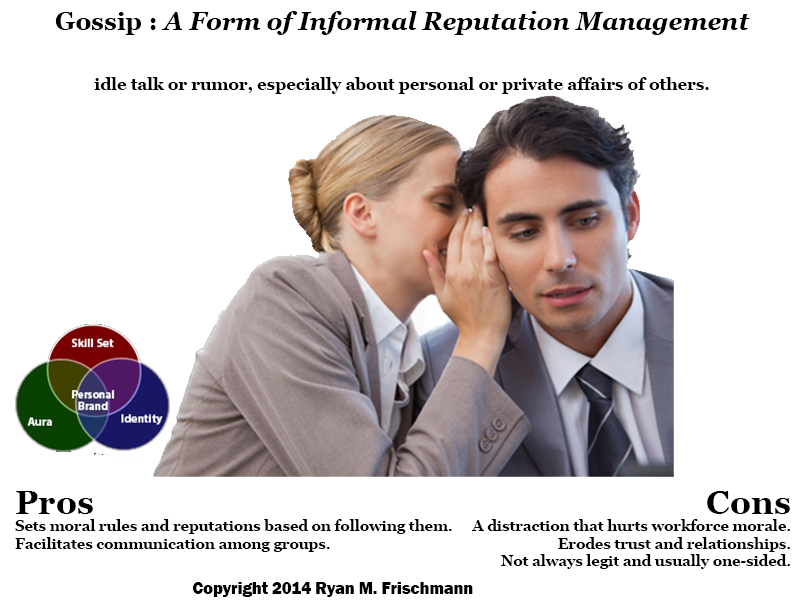 Gossip requires informal reputation management and therefore ties into your personal branding. First and foremost, if you are the target of gossip, it is best to get a handle on what is being said about you. Sometimes it requires a smart response to stop it from spreading and hurting your reputation. Second, if you hear gossip, you need to process the information and choose a response (partake in it or remove yourself from the conversation). And remember this Turkish proverb: who gossips to you will gossip of you. Third, if you are the gossiper, consider how putting yourself out there affects your reputation. Are you providing accurate information and giving both sides of the story? Are you damaging someone else’s credibility? Gossip has been around for thousands of years and will continue to be around; social media is a powerful platform to spread gossip.